Pigeons and doves belong to the Columbidae bird family. They are stout-bodied birds with short necks, and have short thin bills with a soft fleshy bump on their beak. They have short legs and a small head. They have large wings. Pigeons have strong wing muscles, so they are amongst the strongest fliers of all birds. Doves and pigeons build quite fragile nests from sticks and other debris. They may build their nests on the trees on ledges or even just on the ground, depending on the species. The female lays 1 or 2 eggs each time. Both parents take care of their chicks. The chicks will leave the nest after 7 to 28 days. They do produce “crop milk” for their chicks. There are different sizes of pigeons and doves in the world. The largest species are the crowned pigeons of New Guinea which are nearly the size of a turkey. They weigh between 2-4kg (4.4-8.8lbs). The smallest are the New World ground-doves which are almost the same size of a House Sparrow. They weigh only 22 grams (0.7 ounces). The largest tree living species is the Marquesan Imperial Pigeon. It is more than 50cm (19in) long and weight almost a kilo (2lb). However, the Dwarf Fruit dove is the smallest tree living species. It is only 13cm (5.1in). Smaller species tend to be known as a doves, and the larger species are known as pigeons. The largest ever was the world-famous Dodo. Doves and pigeons feed on seeds, fruit and plants. They can be divided into 2 groups – the grain eating group and the fruit eating group. The grain eaters normally feed on the ground, whereas the fruit eaters tend to feed in trees. They are able to cling onto tree branches and even hang upside down to get at the fruits. There are some species like the ground-doves and quail-doves which also feed on prey like insects and worms, besides eating fruits and seeds. For those who eat grains will tend to have dull layer of feathers covering them, with a few exceptions. The fruit eating ones are more brightly coloured. 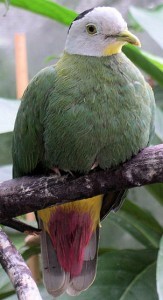 The Ptilinopus fruit doves are very brightly coloured, for example. You can find pigeons and doves all over the world, except for the driest areas like the Sahara Desert and the coldest areas like the Antarctica and its surrounding islands and the Arctic. Most of them love the tropical forests and woodlands. They may be living on trees or on land. Some species also live in the savannas, grasslands, deserts, temperate woodlands and forests. There are a few species of pigeon and dove which are hunted for their meat. For example, in Europe, the Wood Pigeons have been bred for their meat. Apart from that, the pigeon has also contributed to both World War I and II. They have courageously delivered important plans to the Allied forces on the edge of Germany. They were honored for their bravery.